Try out something special by sending this online gift of Trendsetting Basketful of Love and Prosperity to your near and dear ones. 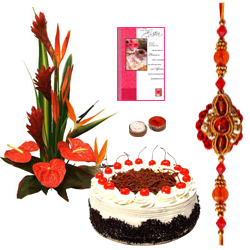 This beautiful Rakhi Set comes with a Card, seasonal Flower Bouquet and a delectable Cake. A Free Rakhi also include with this lovely Gift.